I love the Beginning of the Year in Spanish 1. They come so excited to learn and soak it up like sponges! Instead of spending the first few days yammering away about the syllabus (zzzzzzzzzzzzz) load them up with comprehensible input. This is an awesome activity for the very beginning of level 1! Like even Day 1 or 2! You can keep it totally in your target language and give your little darlings a taste (literal and figurative) of what language acquisition feels like, how effortless it’s meant to be. My district hasn’t outlawed candies in the classroom (yet!) so all systems a go here! If your district has a policy against giving the kiddos candies, you could relocate to to my district in Nevada. Or there’s got to be a clever substitution….I just can’t think of one! Please, share your ideas!! The little darlings are laser focused and super motivated when you’ve got candies. Is it bribery? Maybe. Does it work? Yes! It’s a totally painless way to get in one million repetitions of “has” and “wants”, not to mention colors and question words. The language is so useful and accessible. This is our 3rd day of class…so they’ve got a little bit of Spanish under their belts. We’ve spent a lot of time on “Ríe” and “Llora” because we started out the year singing Celia Cruz’s Ríe y Llora and those words came up naturally so I went with it. Since it’s the beginning of the year, I’m all about teaching and reinforcing procedures, so you’ll see us practicing when their response isn’t satisfactory to me. I’m trying my darnedest to speak SLOWLY and point to the board on nearly every word. I probably could even slow down more…it’s something I’m working on! 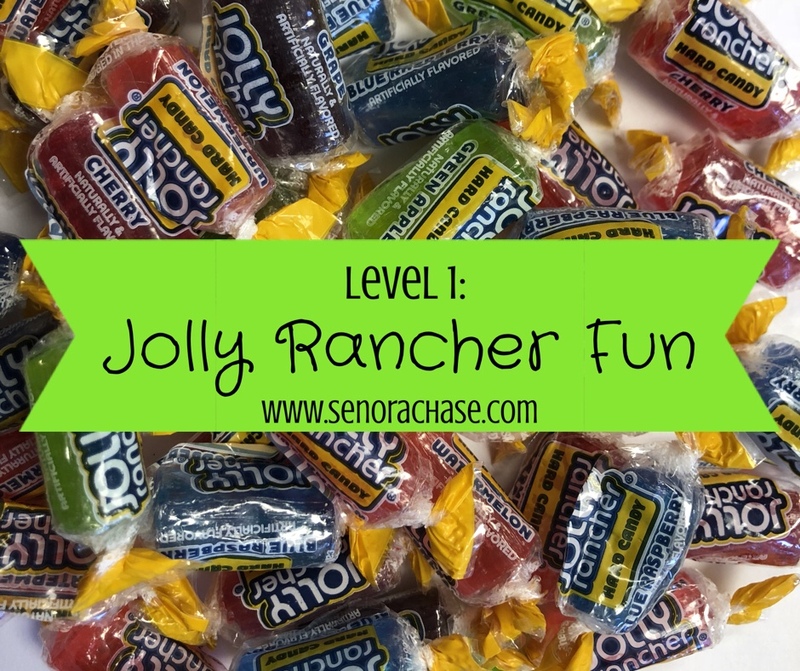 The screen is a bit hard to see in the video…here’s the Jolly Rancher Slide. Notice the Magic Cards to check for comprehension at the end of the video. Love me some Magic Cards. And so does every administrator who has ever observed me. Just saying. Make yourself some Magic Cards! And I really love the call and responses. Project this slide for your little darlings (Spanish version). Thanks to Jaqui Kandell, here’s the French version. If you teach a language other than Spanish/ French and are feeling generous, could you translate it into your language and we’ll share it here? Let me know and I’ll send you the editable slide. Since this is the very beginning of Spanish 1, you’re going to want to set up your expectations. Teach them to signal you when you’re talking too fast or are being unclear. Teach them to respond in unison. Teach them to follow you with their eyes and read what you’re pointing to. Teach them to respond “Sí, Señora” if you think that’s as hilarious as I do. Remember they’re baby beginners: Speak slower than you think you need to. Teach to their eyes. Stay in bounds and check for comprehension. Talk to them. Ask who has the Jolly Ranchers. Ask who wants a Jolly Rancher. Ask who wants a red Jolly Rancher. Ask if he wants a green Jolly Rancher or blue Jolly Rancher. Ask if she wants one or two Jolly Ranchers. Ask the class, does she have Jolly Ranchers or does she want Jolly Ranchers. Alternate between talking to the class “Does she want a red Jolly Rancher?” and to the student “Do you want one or two Jolly Ranchers?” Ask as many questions as you can while they’re still interested. Then revisit the activity in a few days or so. All those reps of “wants” and “has” will serve them well on their language journey! Hope your school year is off to a great start! May 2018-2019 be our best yet!